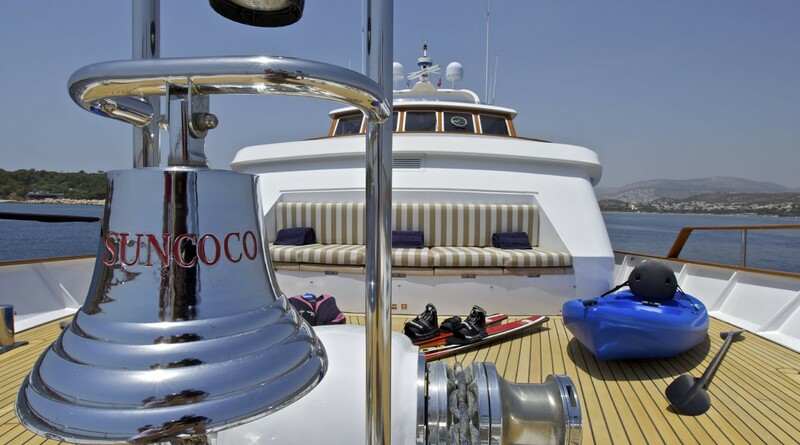 Luxury motor yacht SUNCOCO is a 31,40m (103’) charter yacht designed by De Vries and built by Lowland, Holland. 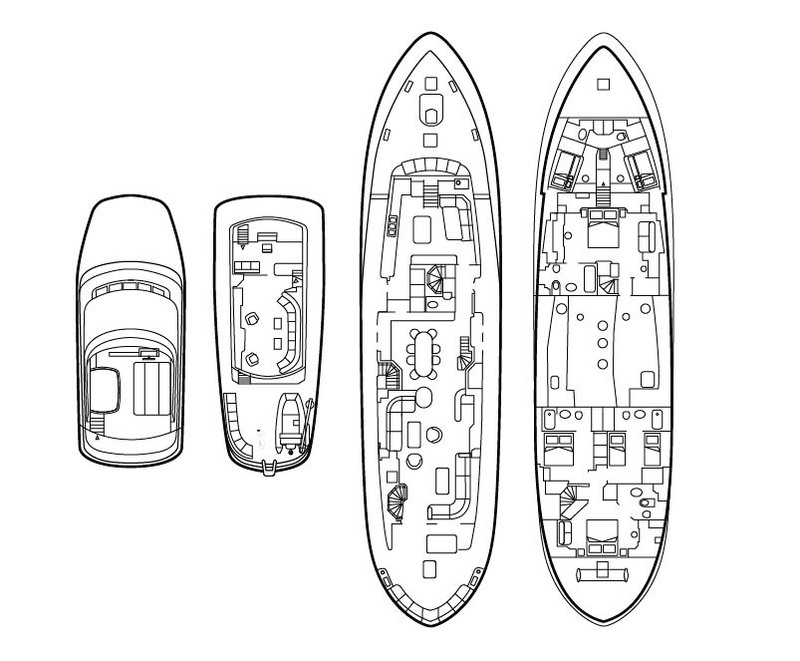 She is a steel displacement yacht with a large volume thanks to her 103ft length and wide beam of 23.7 ft. 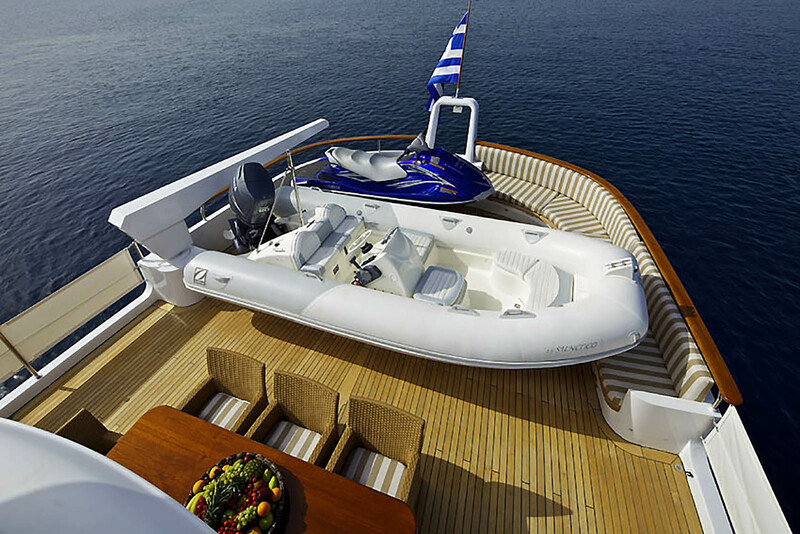 This sturdy vessel ensures smooth cruising throughout the and she also features stabilisers at anchor for extra stability. 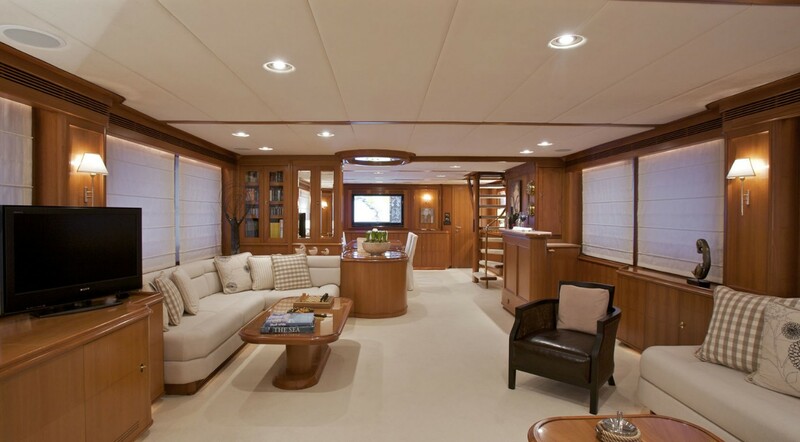 This beautiful yacht boats plenty of room both indoors and out and welcoming atmosphere perfected in her 2009 refit. 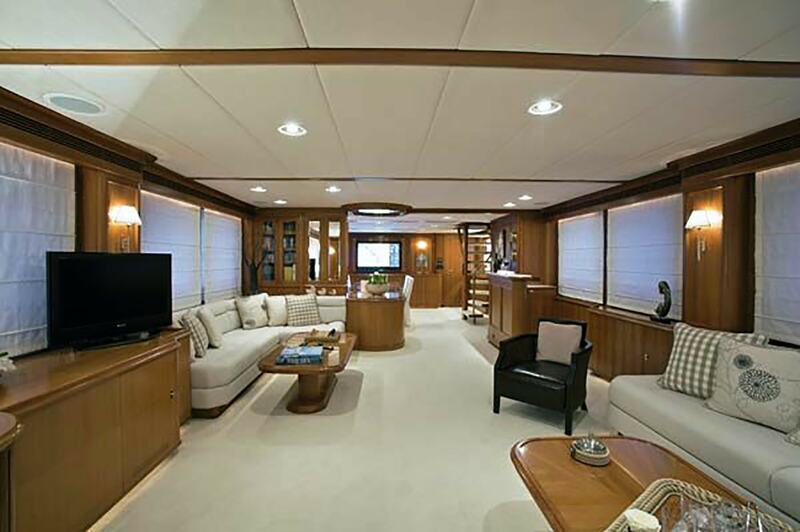 The main salon is accessed via 2 large glass sliding doors that open with a push of a button or the good old fashion manual way. 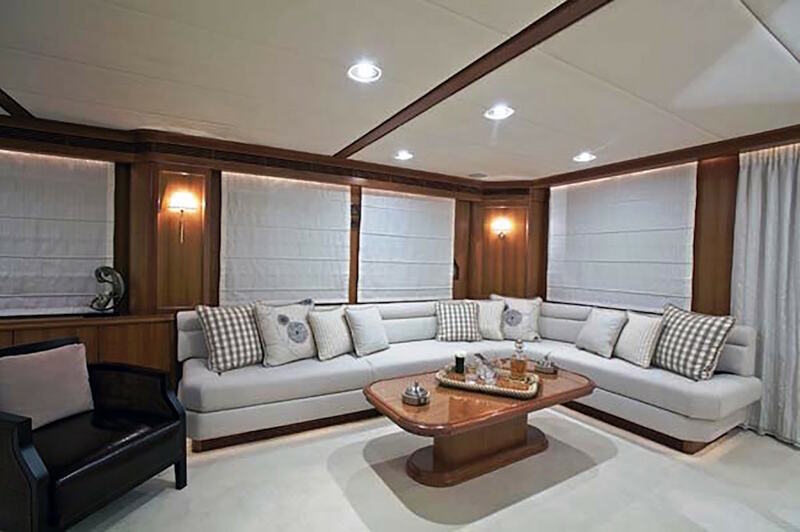 It features an L shaped white cloth sofa and low coffee table to starboard and a long wooden fixed side table with TV to port. 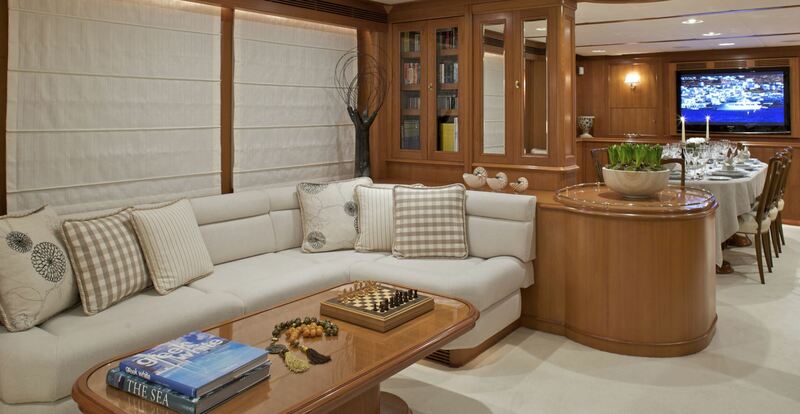 Further, forward to the port side is an additional sofa and coffee table. 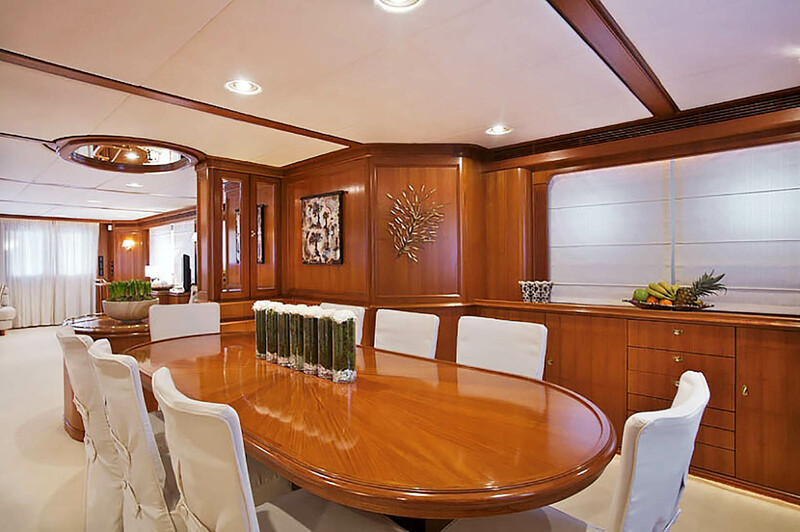 Separating the dining area with the salon is an elegant diminutive library and round table. 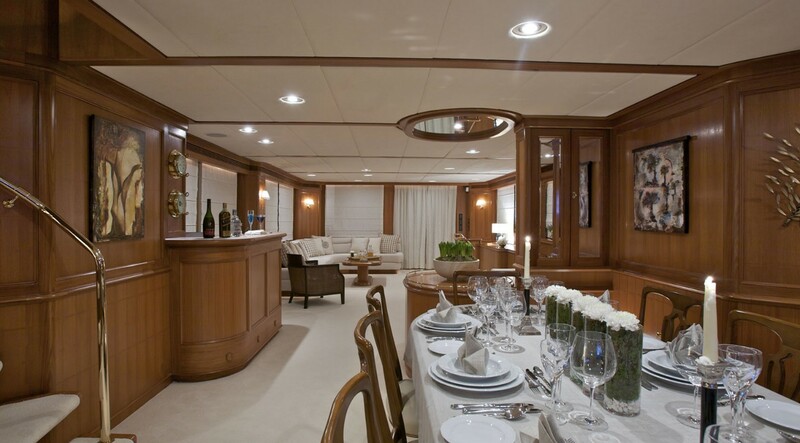 Both the salon and dining areas are spacious and feature panelled walls and an “Alcadara” leather ceiling. 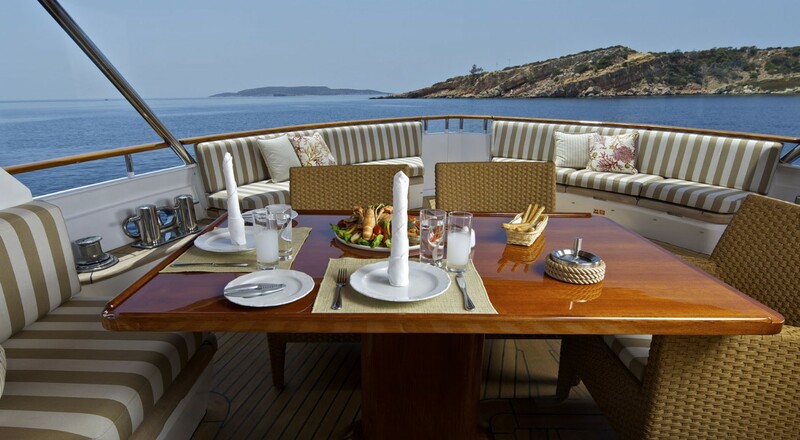 The dining table comfortably seats eight guests and against the wall is a large flat screen TV with two small lights for your viewing pleasure. 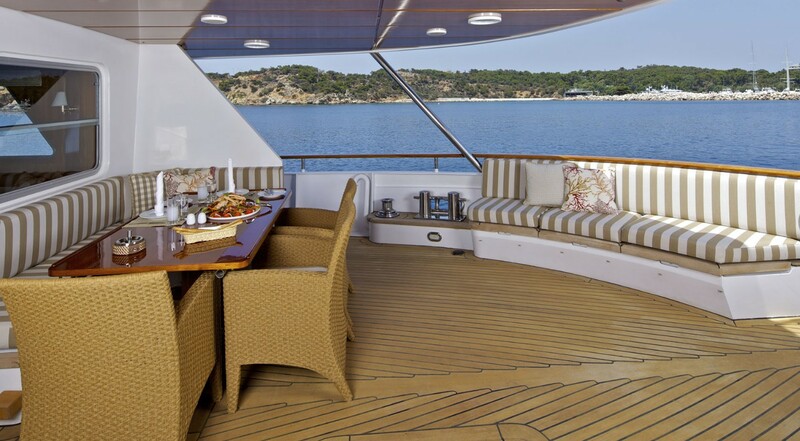 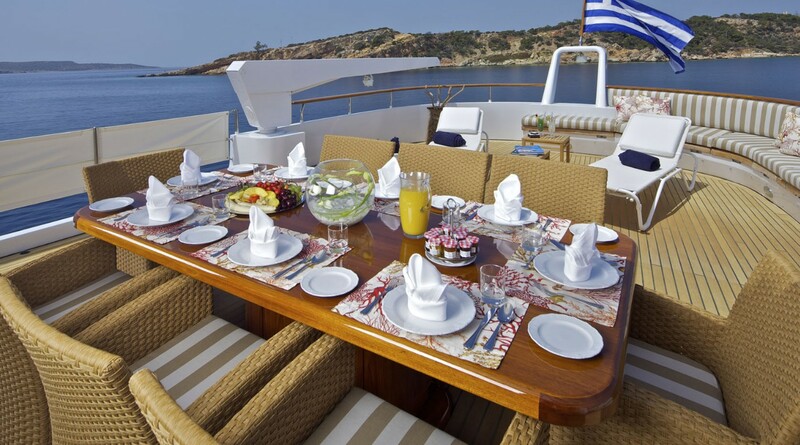 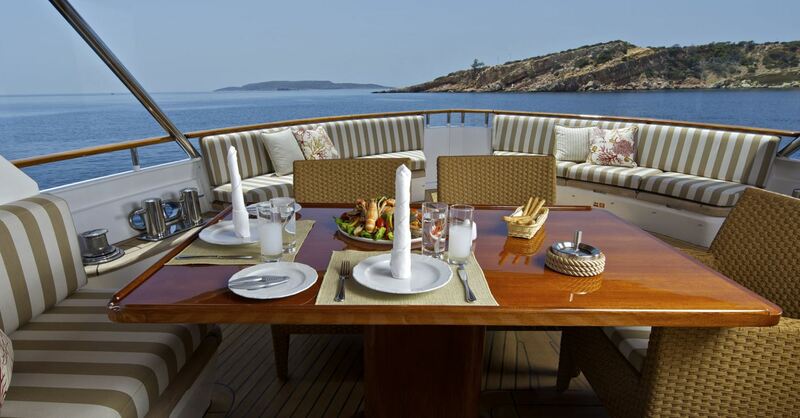 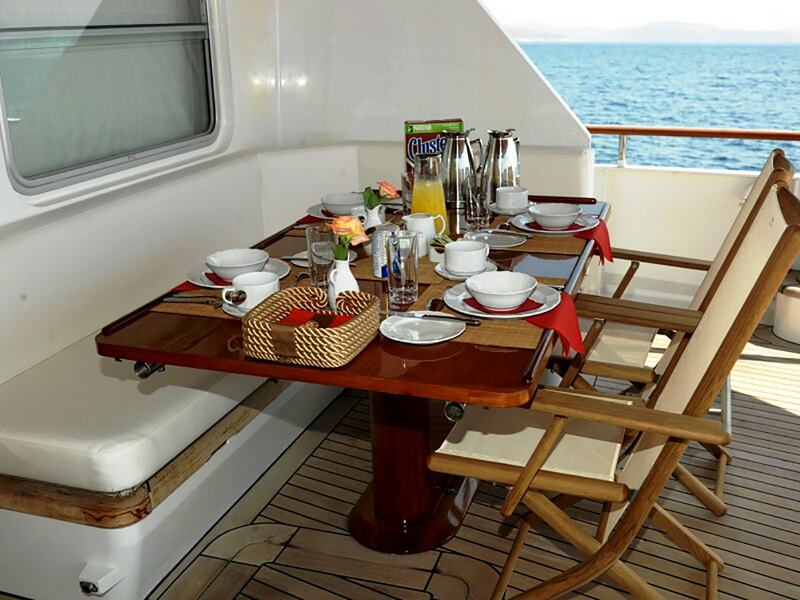 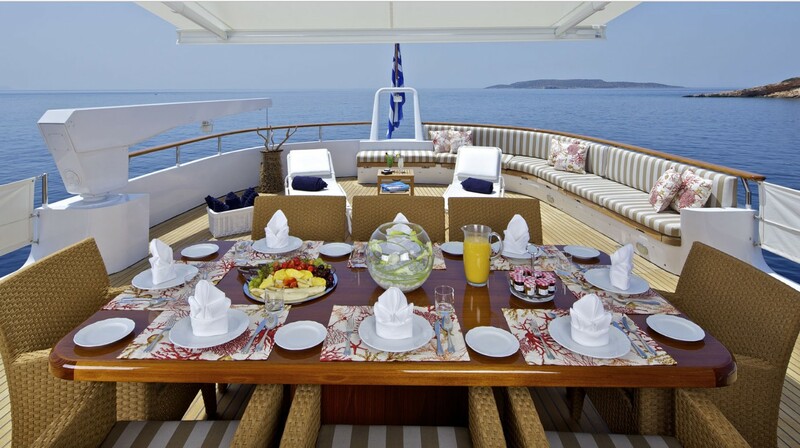 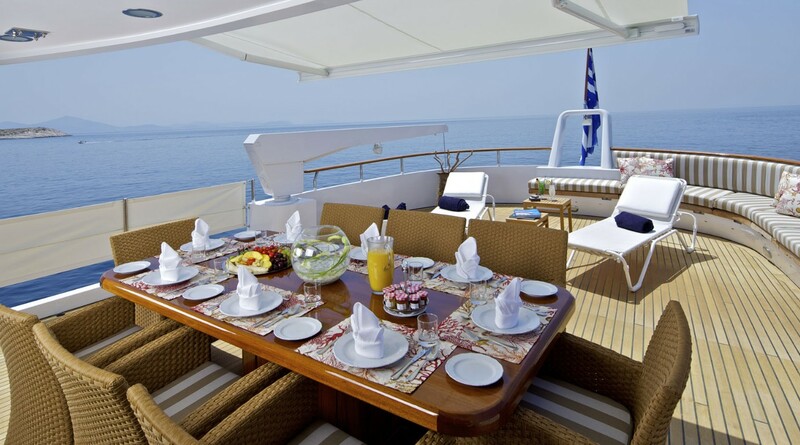 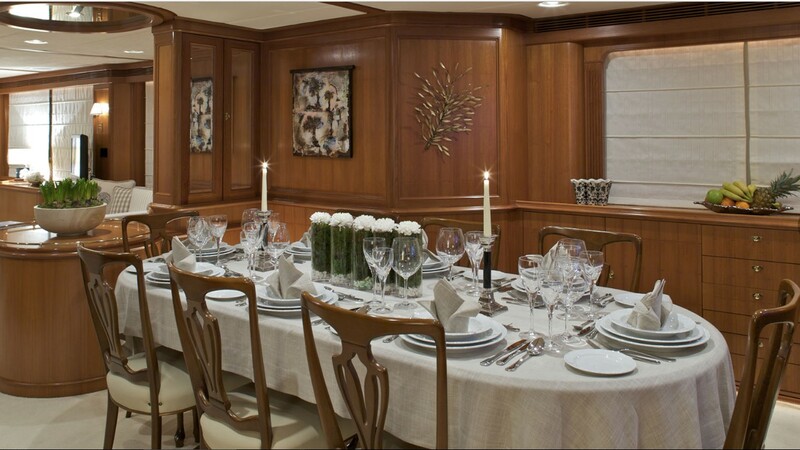 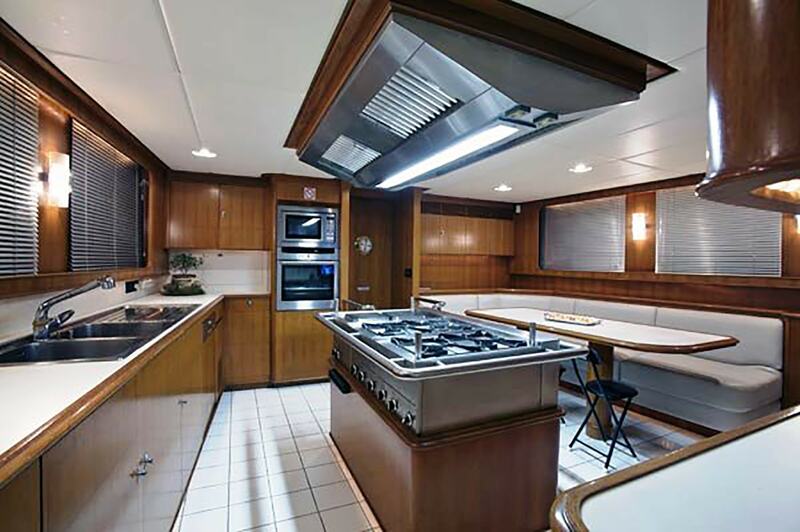 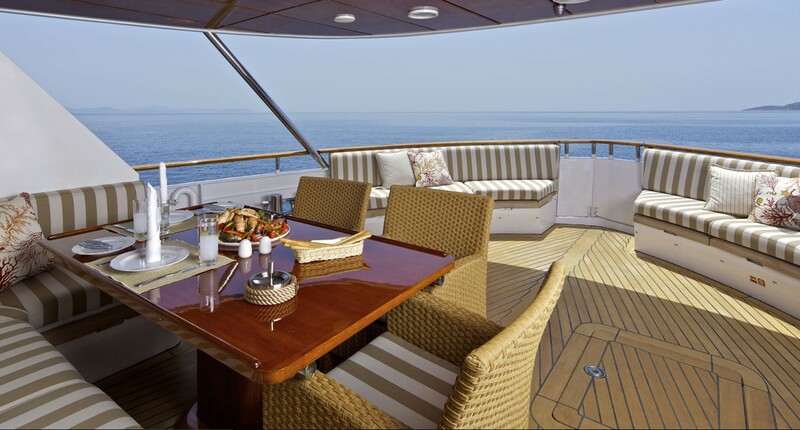 The galley is located forward of the dining room access on the starboard side and is fully equipped. 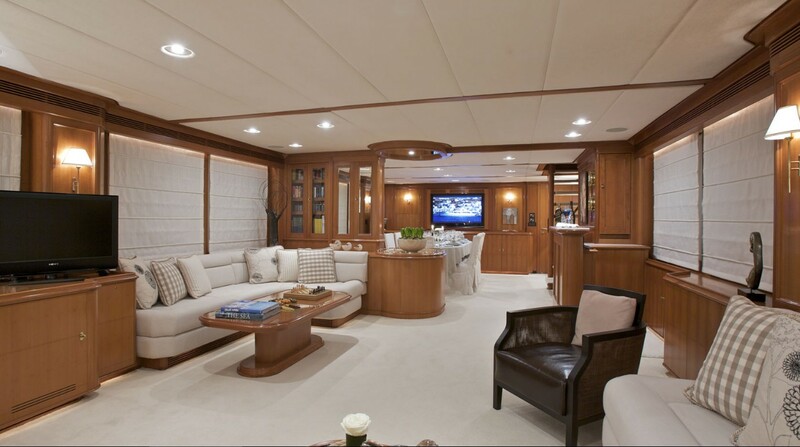 The staircase to the upper level that leads to the sky lounge is the salon and dining room. 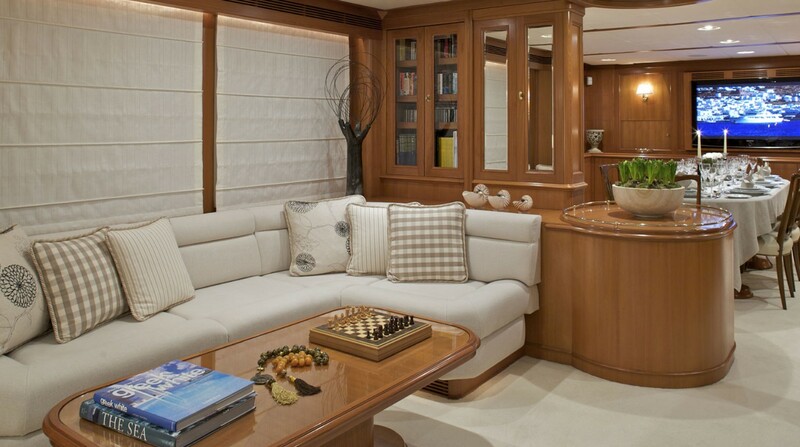 The sky lounge is the ideal spot for quiet relaxation and features of a sofa and small coffee table, facing the flat screen TV. 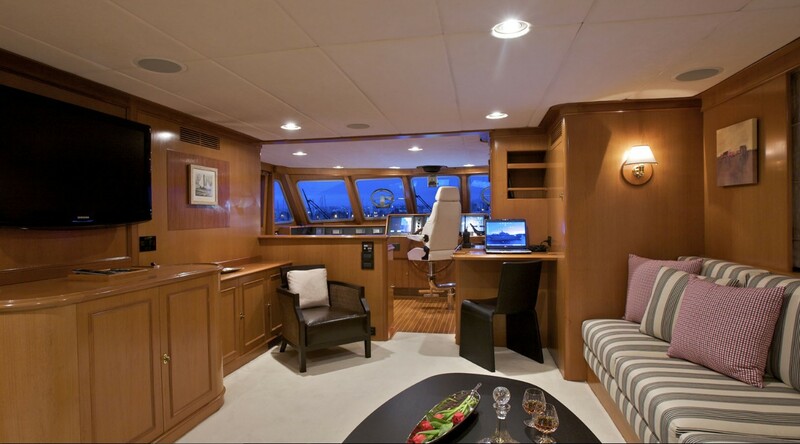 Adjoining the sky lounge is the bridge which gives you the thrilling sensation that you are in command. 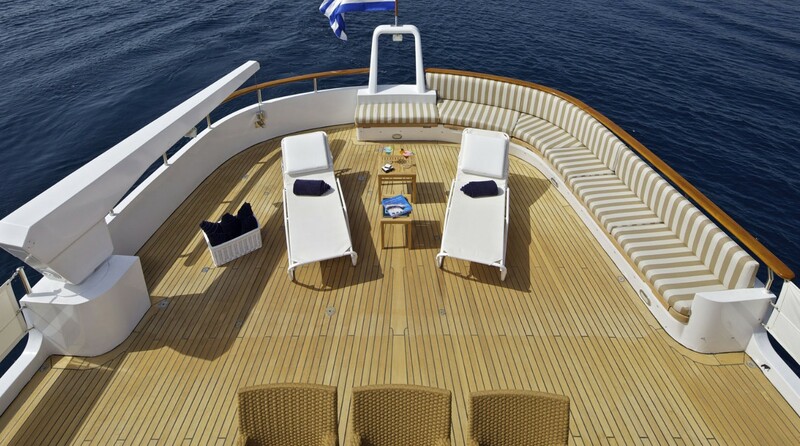 The sun deck boasts 360-degree views to enjoy while you are soaking in the Spa Pool or on the comfortable deck sofa and sun bathing lawn chairs. 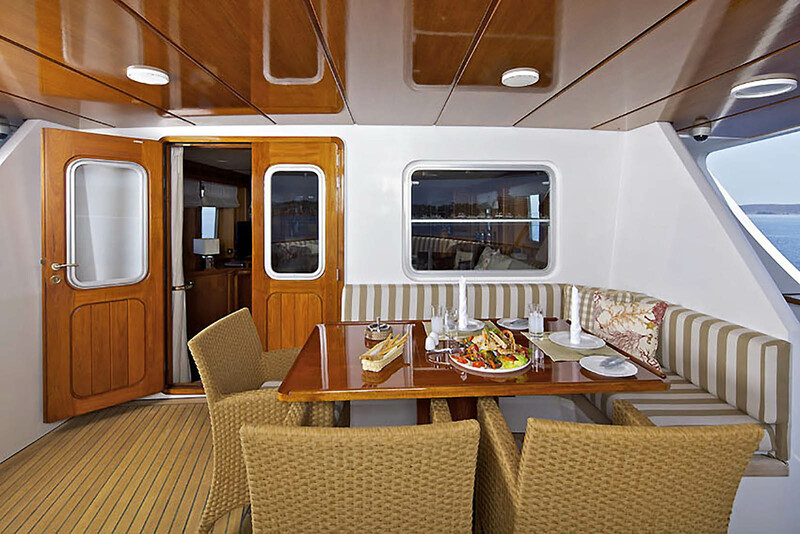 There is enough space to accommodate up to 8 guests in 4 cabins. 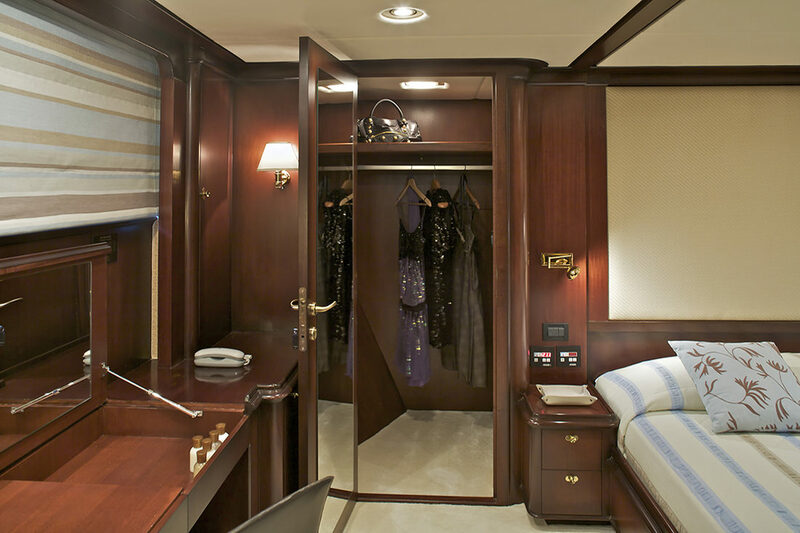 Her master suite features a double bed, sofa and walk-in wardrobe. 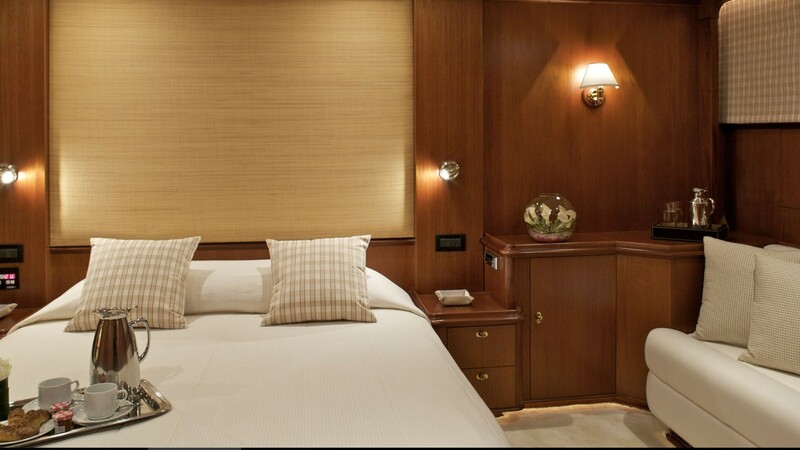 The yacht has 3 further cabins for guests including a VIP cabin aft with double bed and sofa, a VIP cabin with double bed and a Twin cabin aft, all with en-suite facilities. 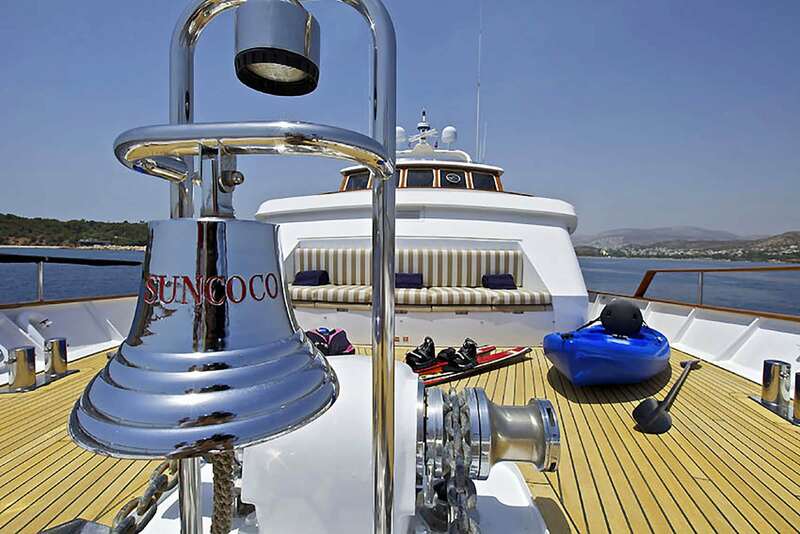 SUNCOCO's interior has been extensively refitted by 2010. 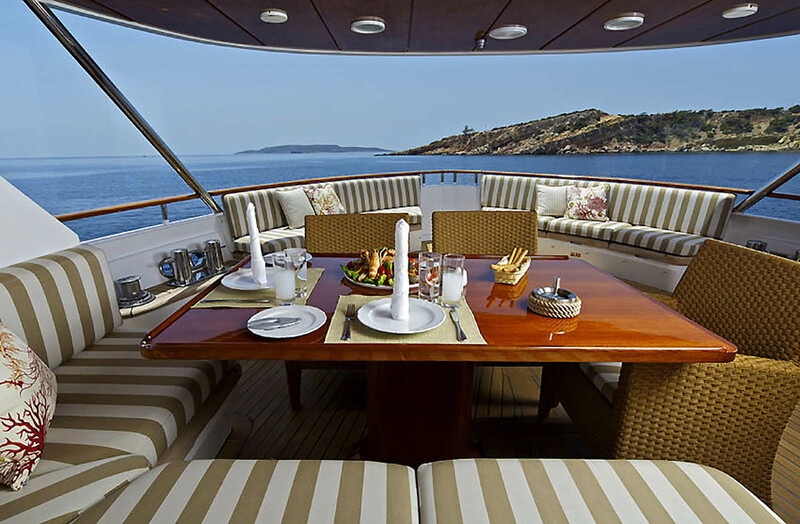 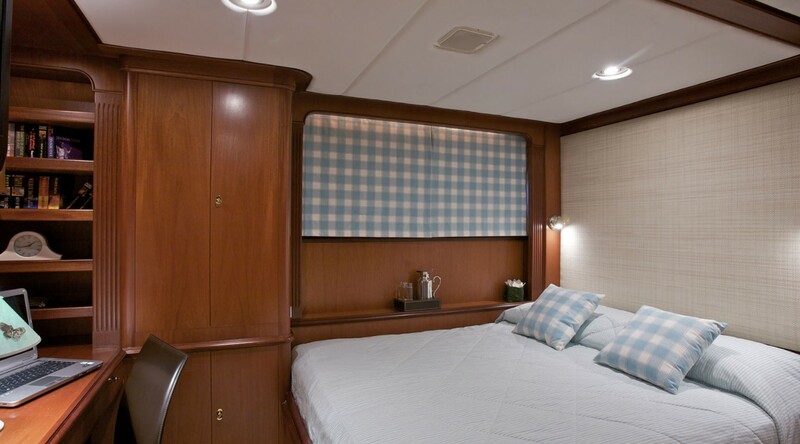 All of the yacht's fabrics, materials, and furnishings have been upgraded. 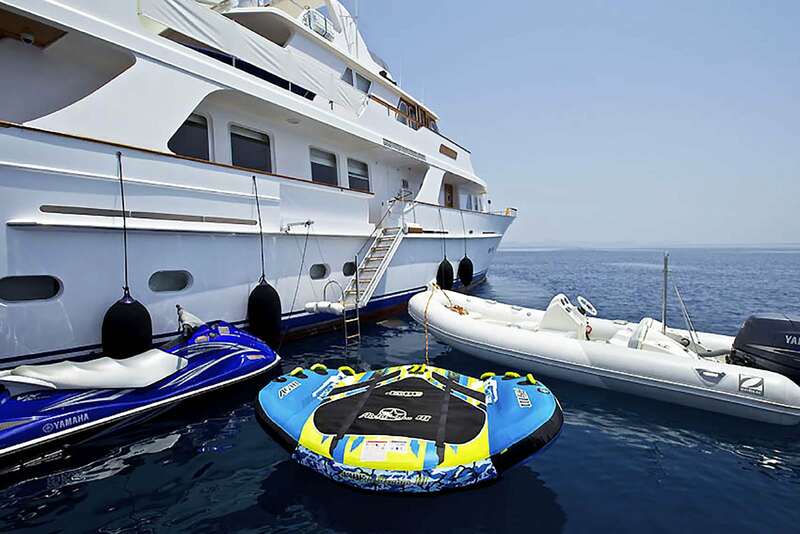 A new electronic system of latest technology has been installed and all water toys have also been replaced. 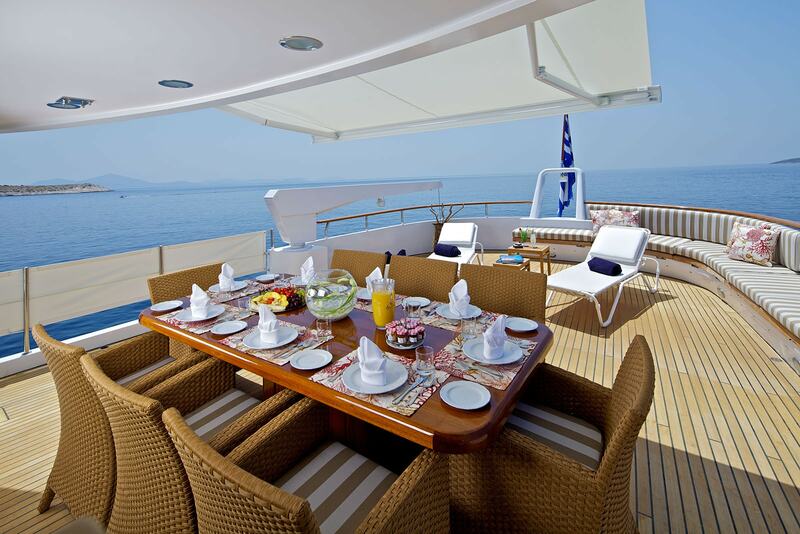 She has a qualified crew of 6 who are ready to welcome you onboard. 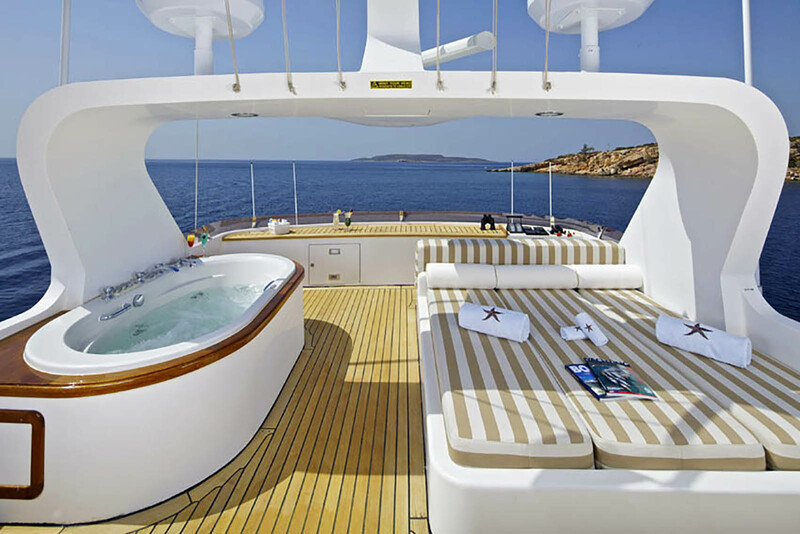 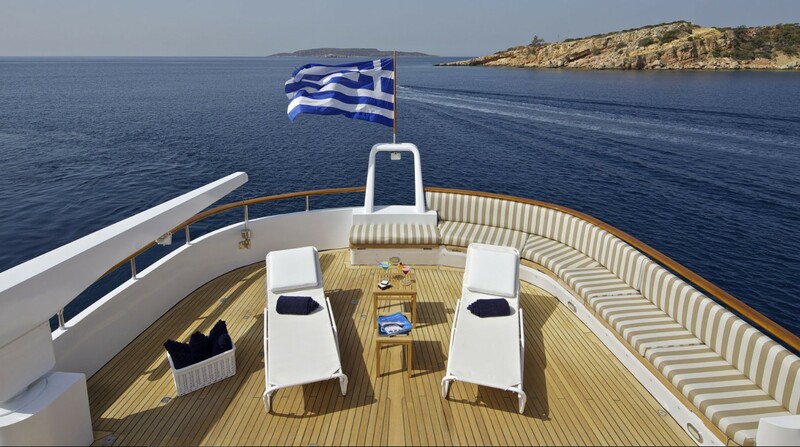 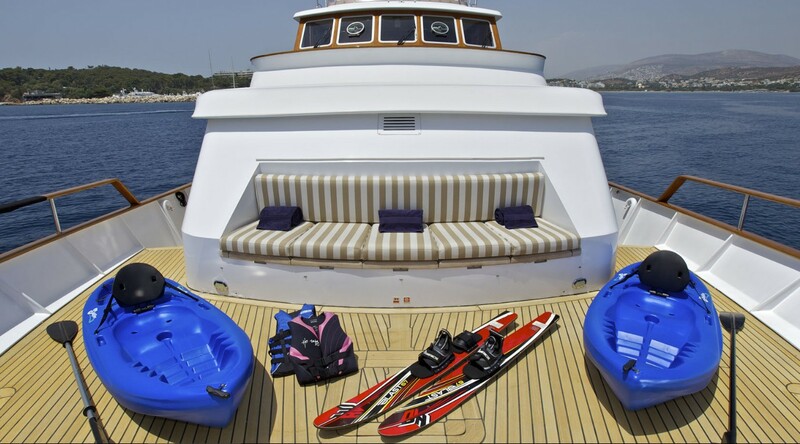 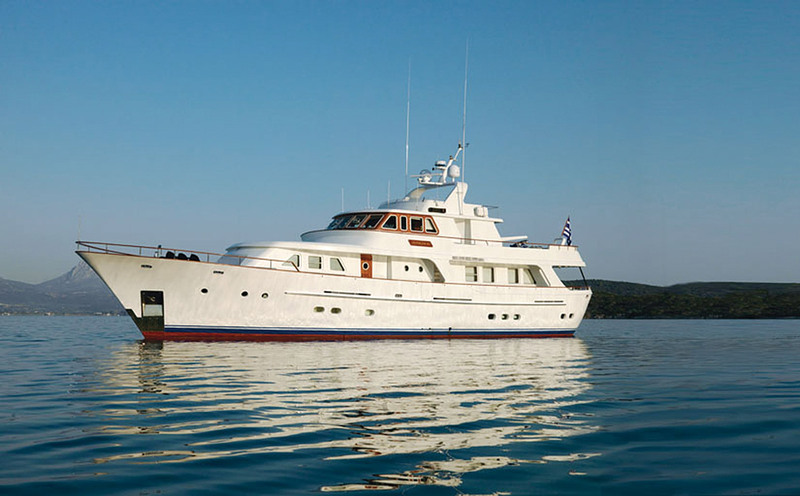 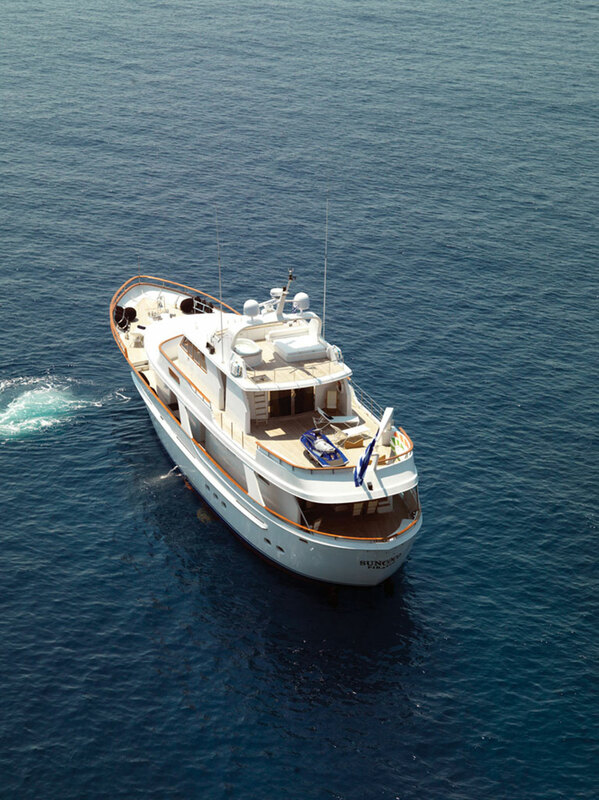 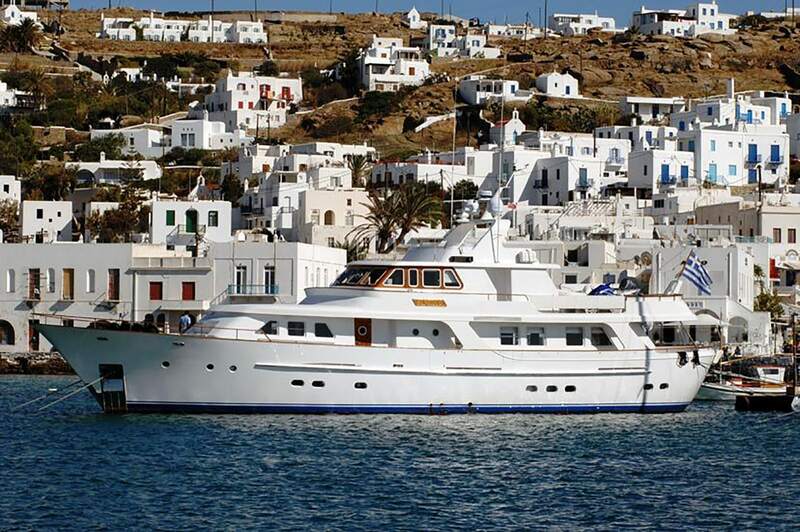 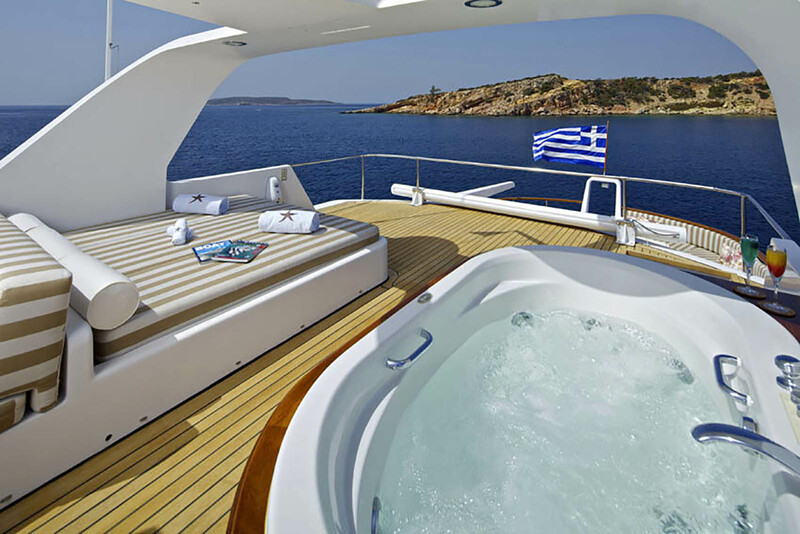 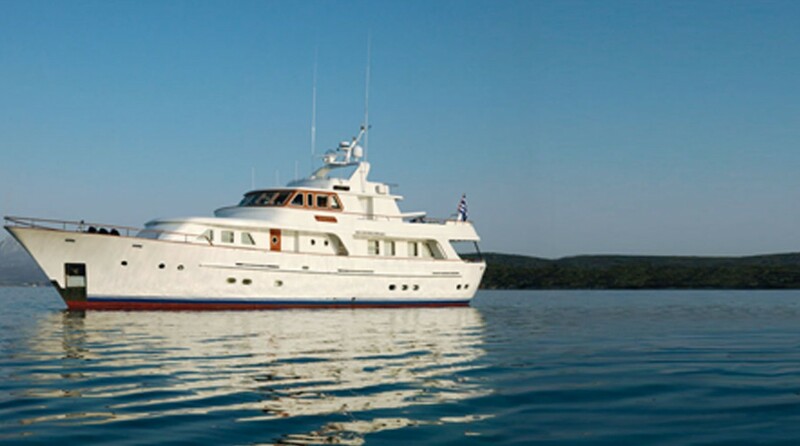 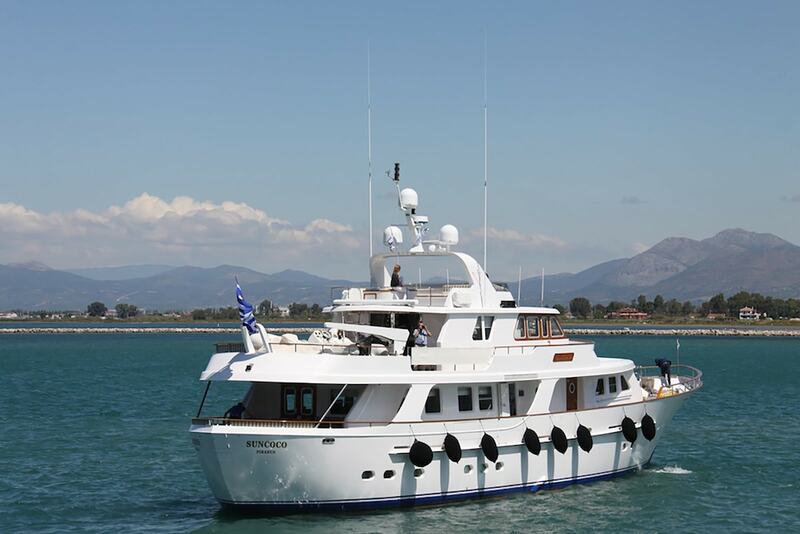 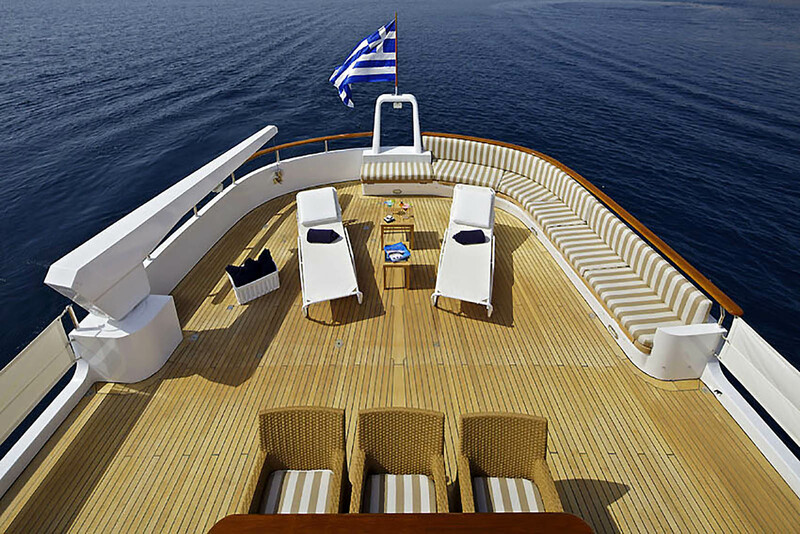 Charter yacht SUNCOCO can accommodate up to 8 guests in 4 cabins. 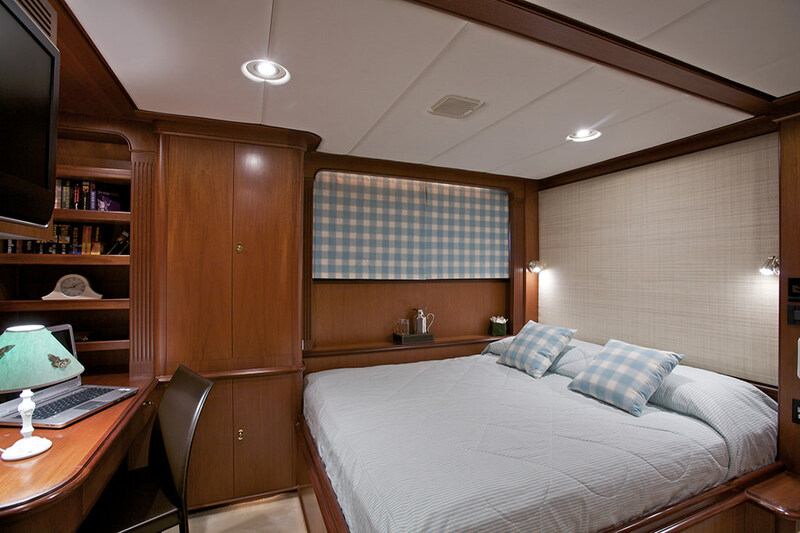 The Master cabin has a large King size bed, with reading lights on both sides. 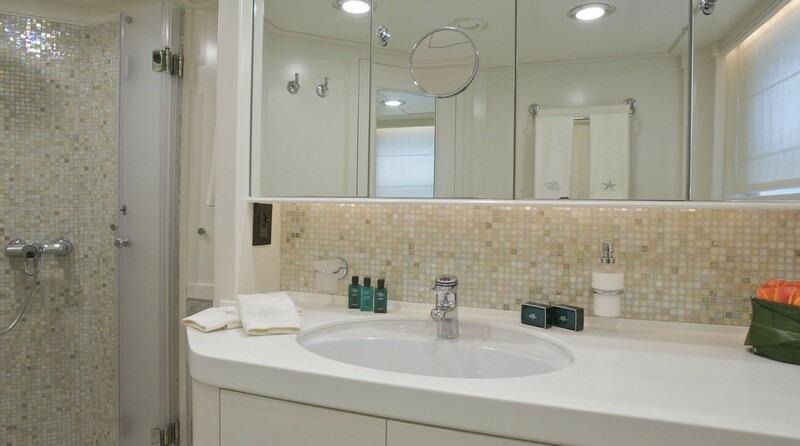 There is ample storage space with a large walk in closet plus drawers and regular closets. 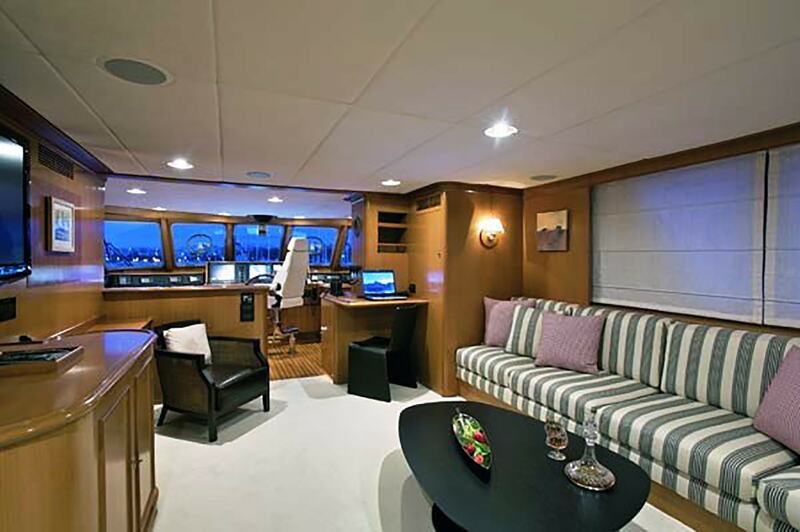 To port, there is a desk and to starboard, there is a small couch. 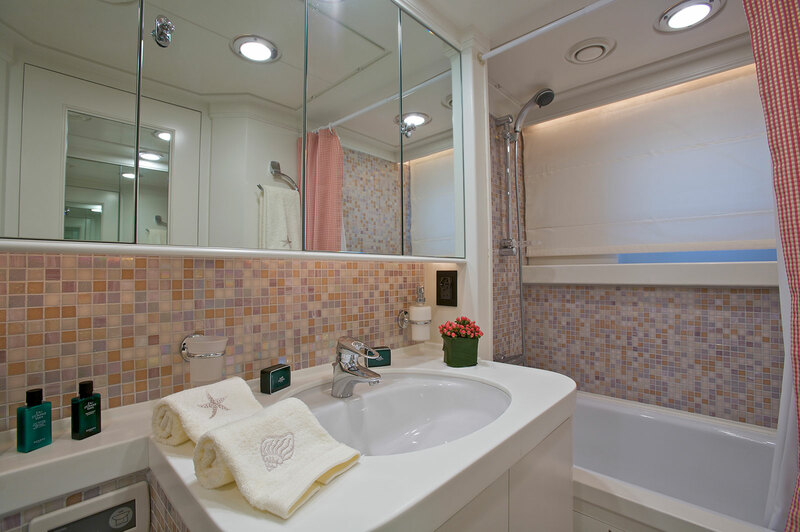 The bathroom has a single water basin and glass case shower. 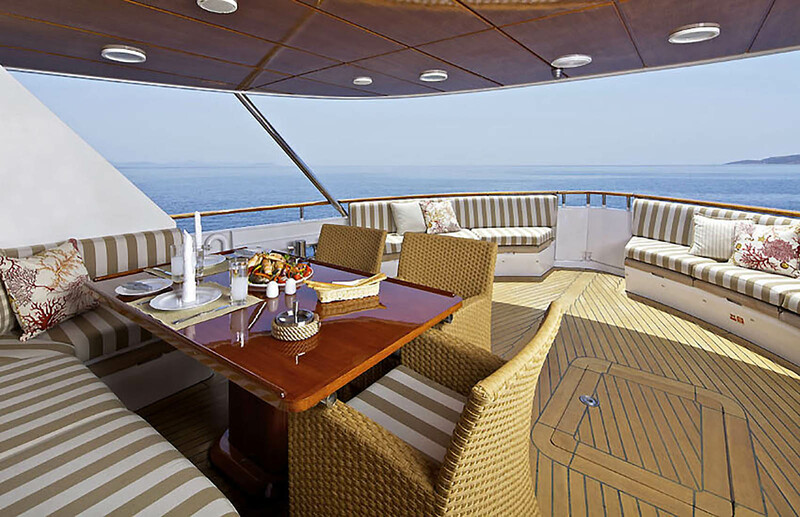 Lastly, should you wish to keep your valuables secure, there is a safety box in the cabin available for your use. 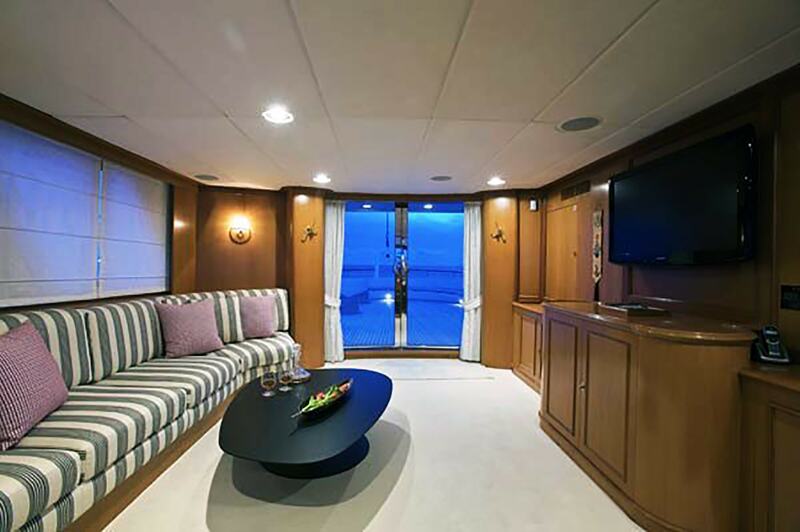 TV/DVD/stereo system and air-conditioning are also situated in the cabin, for your comfort. 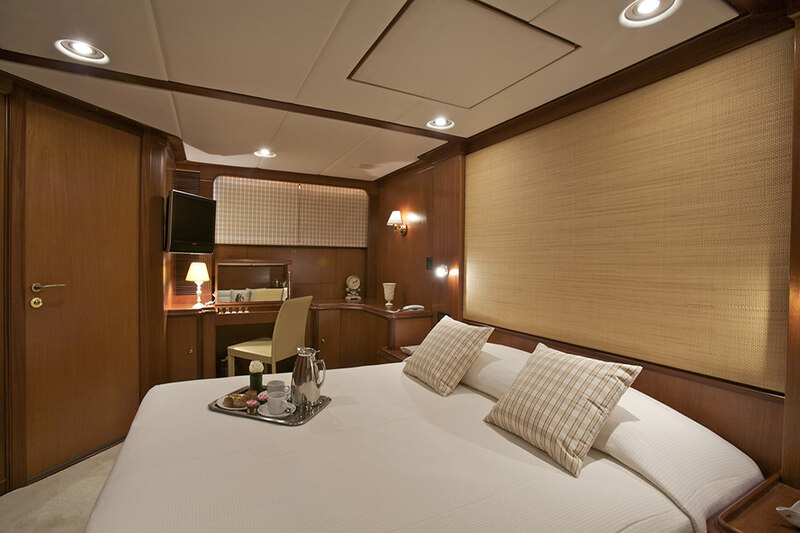 The VIP cabin also has his and hers walk-in wardrobes, a desk with the port of the Queen size bed and a snug sofa to starboard. 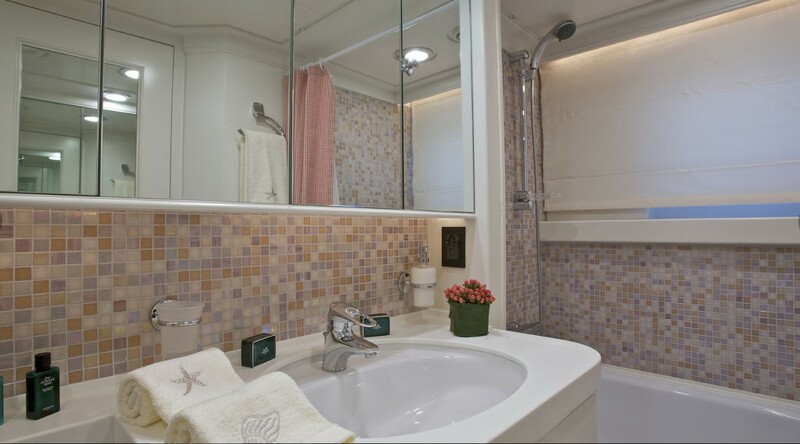 The en-suite bathroom has one water basin and a glass case shower. 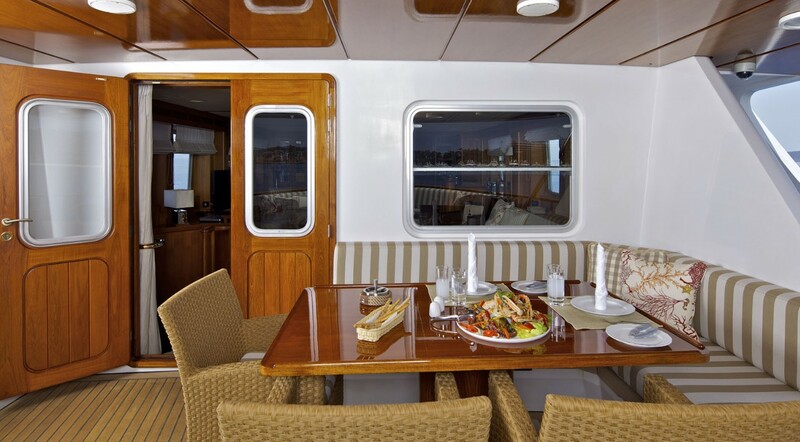 TV/DVD/stereo system and air-conditioning are also situated in the cabin, for your comfort. 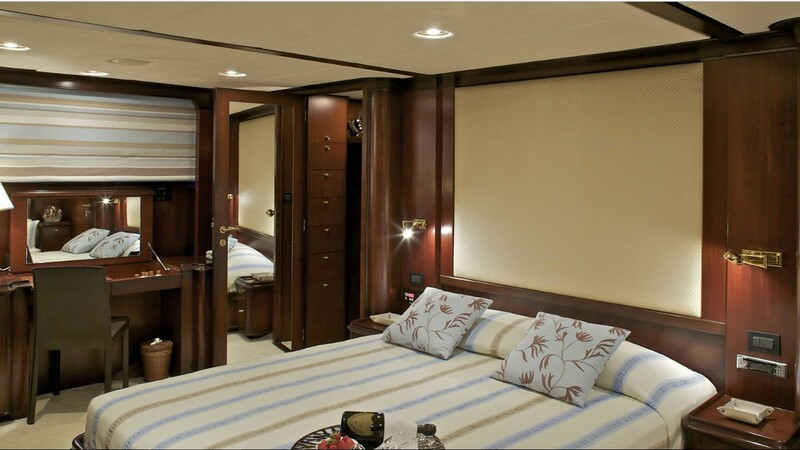 The double cabin features a double bed situated to port against the wall and an en-suite bathroom with bathtub and water basin plus a spacious closet, TV/DVD/stereo system and air-conditioning. 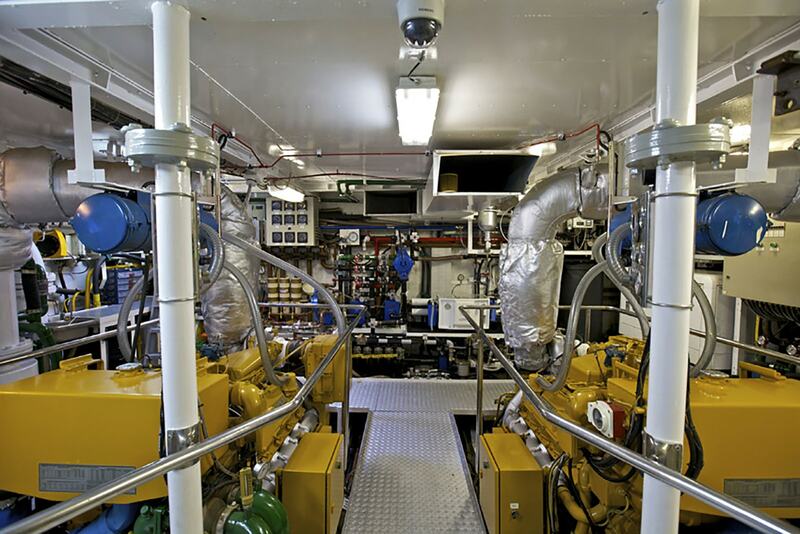 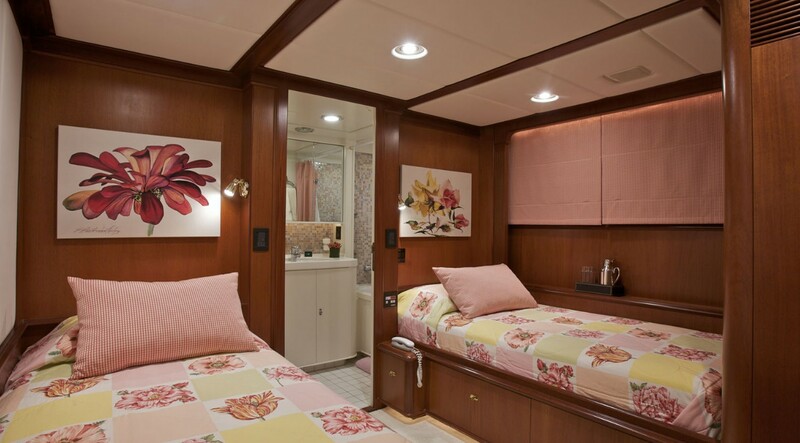 The Twin cabin features two single beds with cheerfully coloured bedding. 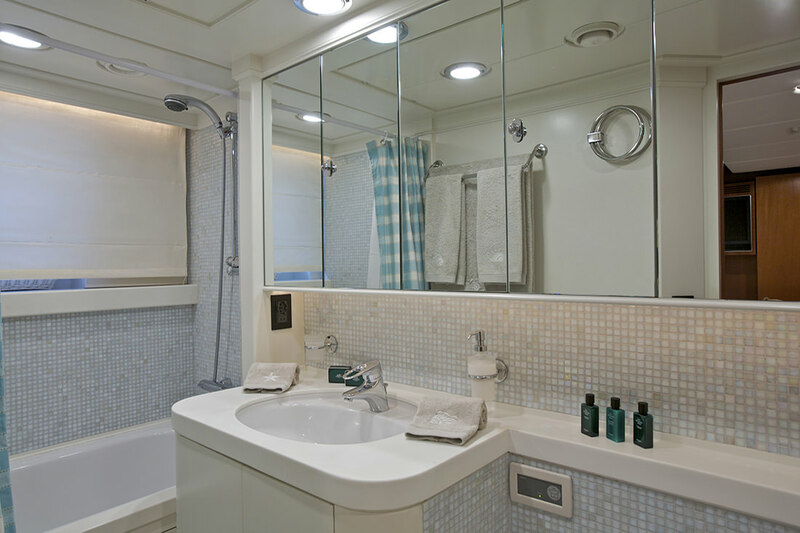 This cabin also has an en-suite bathroom at the end of the cabin with one water basin and bathtub. 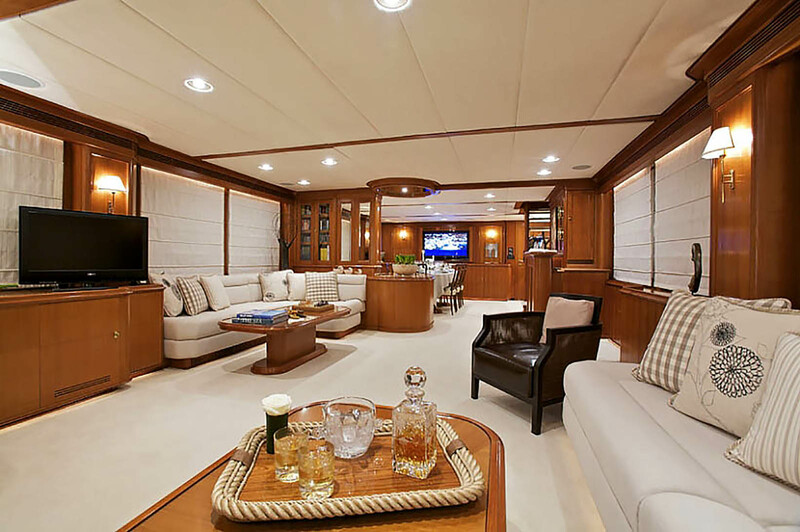 TV/DVD/stereo system and air-conditioning. 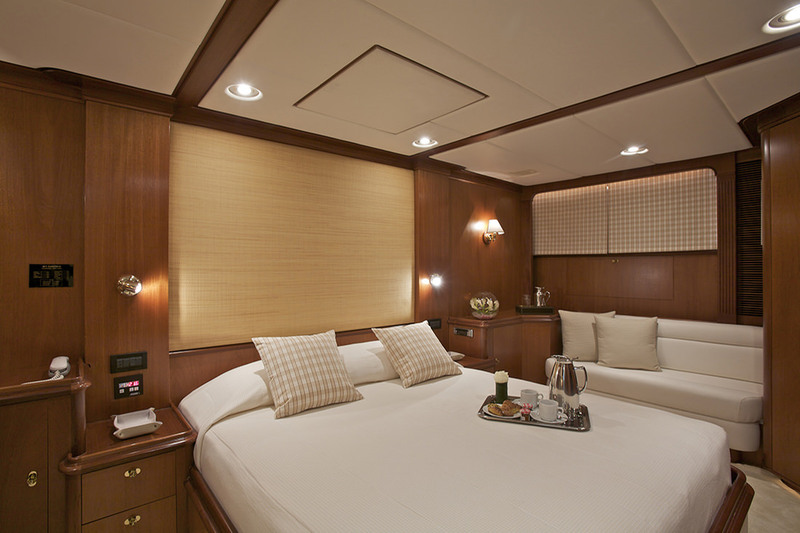 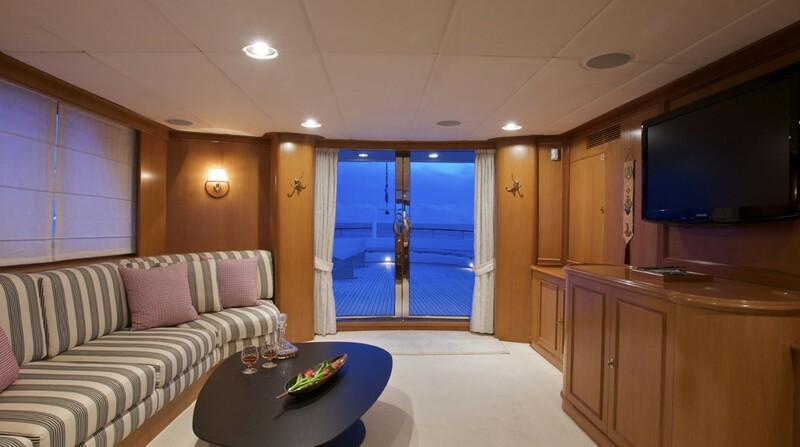 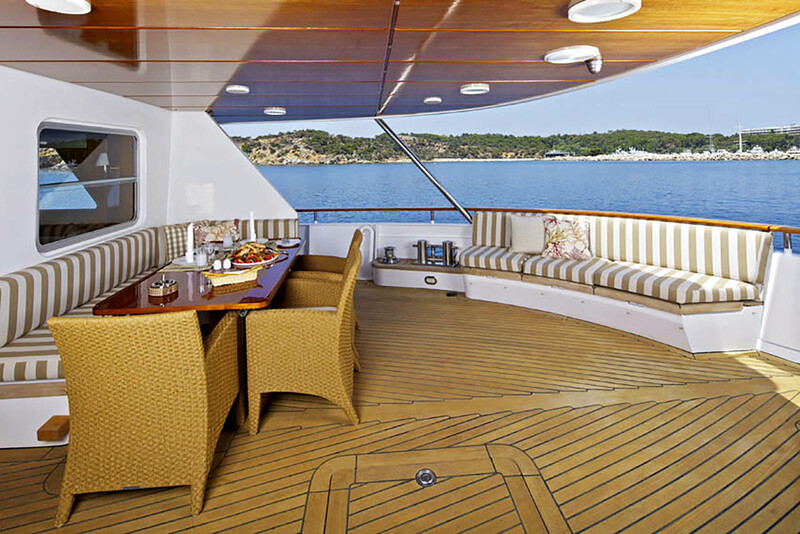 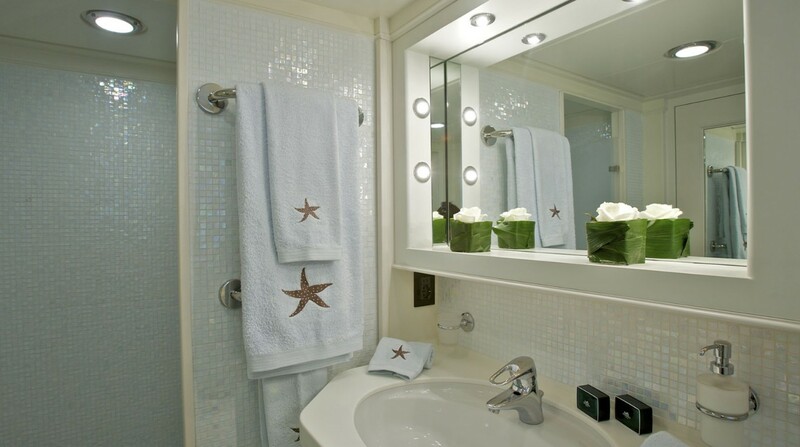 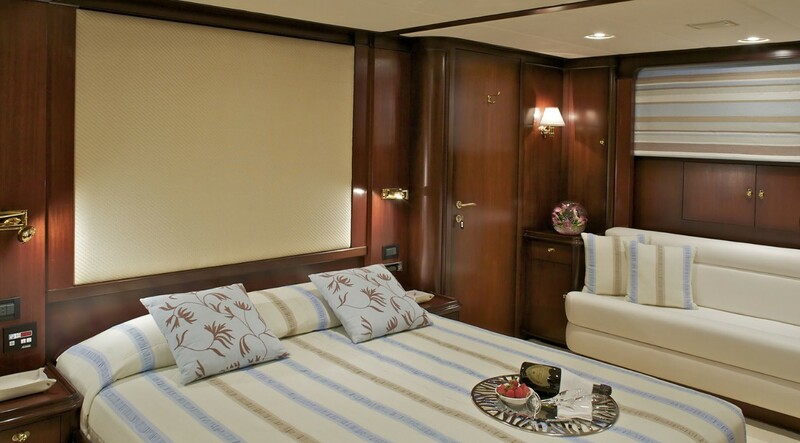 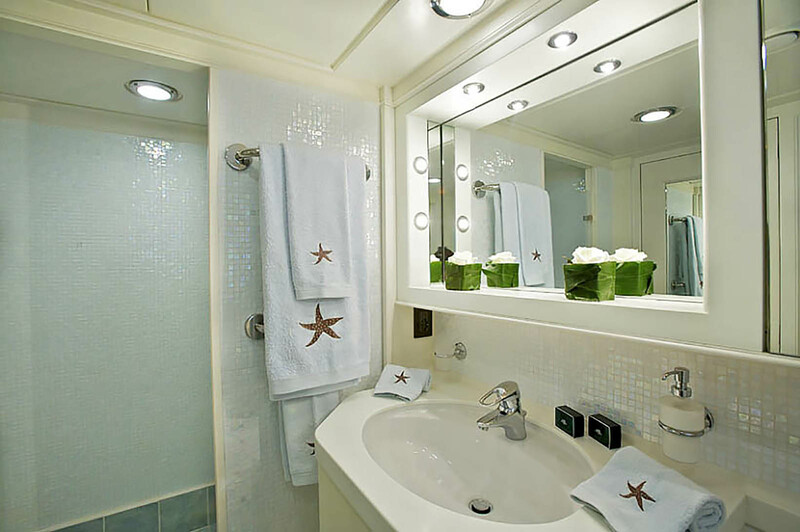 All of the cabins on motor yacht SUNCOCO are elegantly decorated with the finest of materials and fabrics. 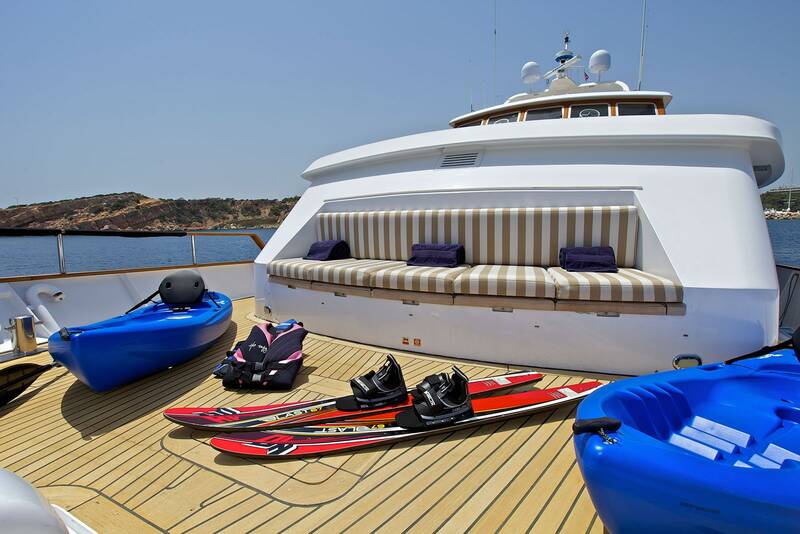 Motor yacht SUNCOCO has extras onboard for guests to enjoy such as a 4,7m ZODIAC rib with Yamaha 80hp outboard, Jet ski, tubes, banana, water-skis, snorkelling and fishing equipment. 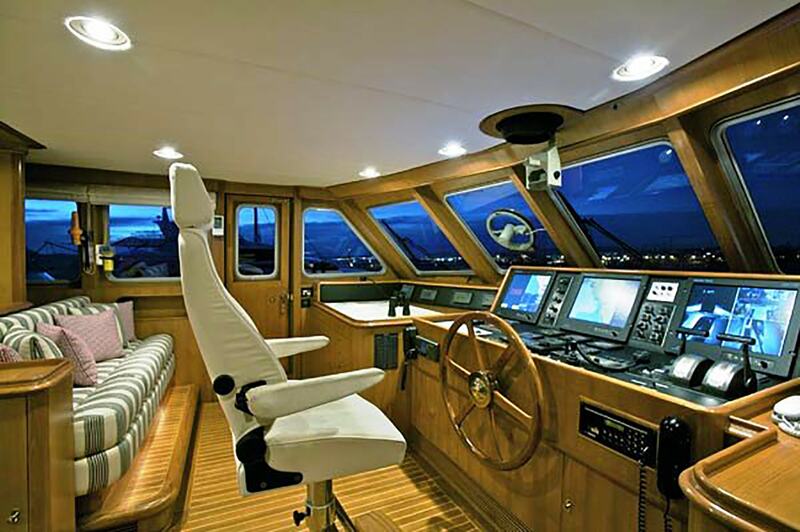 Communications include Satellite com with telephone and fax (FLEET 33) internet, e-mail service, GPRS and GSM Phones, GPS with Plotter, Vatex, Autopilot, VHF/DSC, SSB, EPIRS, Electronic Charting System. 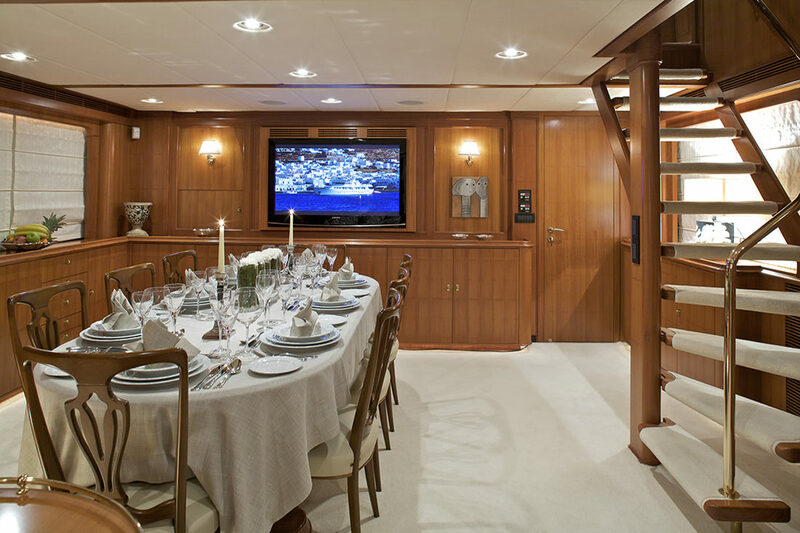 Audio Visual Equipment and Deck Facilities include Satellite TV/audio/DVD individually controlled in all cabins, salon and sky lounge, Play station 2/Books/Board Games. 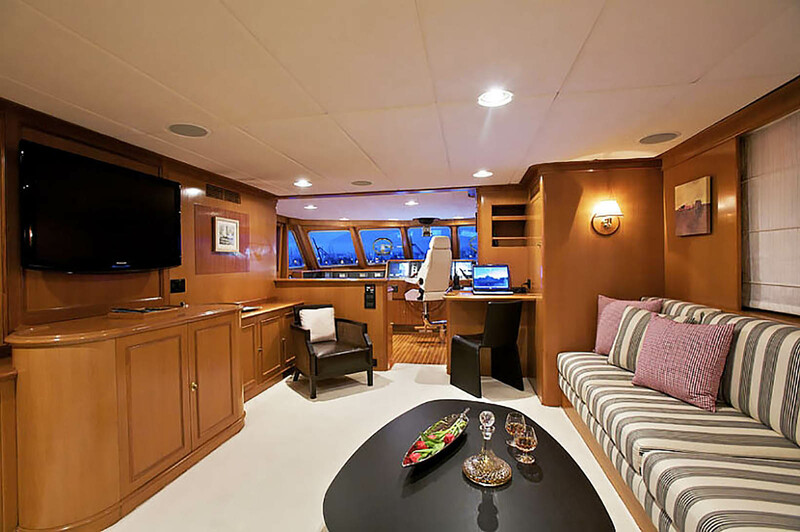 The yacht also has Stabilizers, Bow thruster, 2 Radars, ARPA, AIS, Electronic Charting System, GPS with Plotter, Navtex, Autopilot, VHF/DSC, SSB, EPIRS, safe box in Master and Bridge.